So, I haven't made risotto in a long time, and I wanted to try my hand at a non-dairy risotto. I saw a nice looking butternut squash at the farmer's market on Friday and decided that would make a nice complement to the risotto. I also found some pear cider from the same stand that I got the really good apple cider from the other week. I'd never had pear cider, so I figured I'd give it a shot. I looked at a whole bunch of basic risotto recipes on Recipezaar and a couple of my cookbooks and settled on an amalgam of them all. Some interesting things I picked up from my research was the idea to use sun-dried tomatoes, as well as an unexpected ingredient - vanilla. A lot of recipes with butternut squash seemed to combine it with sage - I wanted to use a fresh herb, but I just used sage last week in my soup, so I decided to try something different - fresh thyme. It turns out that this might not have been a good idea - maybe everyone said to use sage for a good reason. The thyme was okay, but it gave the dish a floral taste which I was not looking for. As you can see from the picture, the dish came out beautiful with a great risotto texture. But the flavor was a little off. It was a little too sweet and fruity - I guess I hadn't realized that the squash itself would lend considerable sweetness that didn't need to be supplemented. I picked up on this as I was finishing the dish and decided to add a few dashes of lime juice to make it a little more tart. That helped, but not enough. I think the pear cider ended up being a bad idea and was unnecessary. One interesting thing was the cooking method I used for the squash. I started boiling it in the stock, but it kept the broth from heating up a bit and I was in a big rush. So I removed the squash and roasted it in the oven till it started caramelizing which definitely helped the texture and flavor there. I think the flavor ante in this dish can definitely be boosted. Here's how I would improve the recipe next time: I'd add more tomatoes and shallots, swap the thyme for sage, swap the pear cider for an extra cup of broth, and maybe try adding some different savory spices (turmeric, my "Moroccan wonder spice," comes to mind). I'd also consider leaving out the vanilla, but I'm not sure yet if that helped or hurt. One note about the squash disassembly method: I took that from the Sister Cooks' blog - it was useful, having had to chop a squash the harder was before. Here's the recipe as I originally made it, though in my notebook I wrote it down with some of these modifications already in there. Please feel free to improve on it and let me know what you come up with! 1. Microwave squash for 2 minutes. Separate the bulb from the rest of the squash; peel the rest and cube it. Extract the seeds from the bulb and save for later. 2. Place squash into a pot with chicken broth and pear cider over medium heat. Add salt to taste. 3. Saute shallots in oil in a skillet over medium heat. When they begin to brown, add rice and saute until most of the grains are coated with oil. 4. Remove the squash from the broth and place on a greased baking sheet. Roast squash in an oven preheated to 475 unti the squash begins to brown (this should end up coinciding roughly with finishing the risotto). 6. Pour in wine half a cup at a time, similar to above process. 7. Add in vanilla and stir. Add fresh thyme leaves, lime juice, salt & pepper to taste. 8. 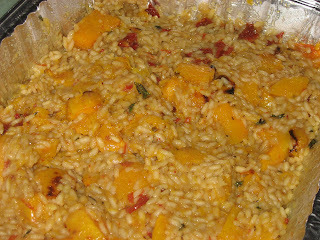 Transfer to serving dish or aluminum tin, and add tomatoes and roasted squash and mix well. Try saffron, maybe caramelized onions?